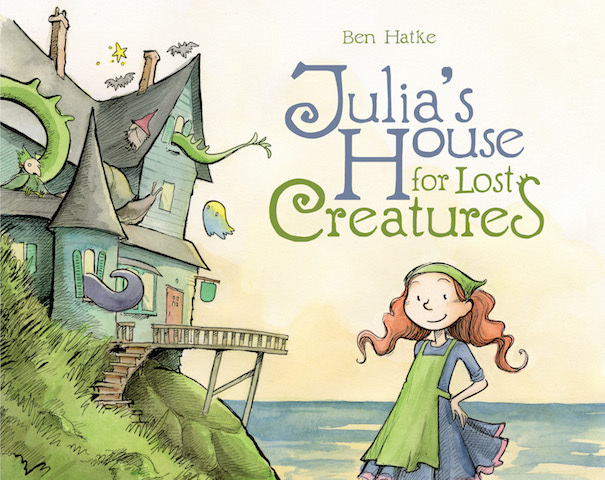 This book has the makings of a hit – I read through my review copy of Julia’s House for Lost Creatures by Ben Hatke and everything just suits the book so well. The illustrations, the colors, and the titular Julia herself. I love how in just a few pages you can get an idea in a picture book of what sort of person a character is, not because the narrator tells us they are nice or that they are kind but because we see it from their actions. I hate to engage in comparison when I think this book is fabulous on its own but if you like Neil Gaiman’s children’s literature (whether it is Blueberry Girl or The Graveyard Book) then you will love this. Julia is independent and intelligent but decides she could use company so she invites, via a sign outside her door, lost creatures to take refuge by her hearth. It is lively and crowded but Julia has to get the mermaids and trolls and my favorite, the patchwork cat, to help around the house so everyone can enjoy the space. Highly recommended, a must read/buy. This book will be released in September 2014.